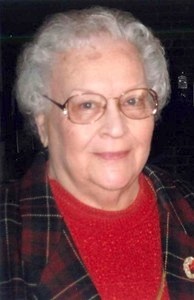 Mary Lee Baker Clark of Olathe, Kansas, passed away on Monday, January 18, 2016 at the Good Samaritan Society Nursing Center in Olathe following an extended illness. She was born August 11, 1928 in Sikeston, Missouri, to Harve and Floy Randolph Baker, and was preceded in death by her parents and a twin brother and sister, Raye Baker and Faye Baker Heacox. In 1946 she graduated as salutatorian of her high school class. On August 13, 1949 she married Webster Clark, who survives. She is also survived by three daughters, Joy Shaver, Anita Clark, and Candace (Mark) Underwood, three grandchildren and two great grandchildren, as well as a number of nieces and nephews. She was much loved by her family. She was a homemaker while her children were young, and later worked a number of years in retail photo sales. In 1984, she and Webster relocated from Sikeston to Olathe to serve as assistant resident mangers of the Good Samaritan Towers apartments in Olathe. Mary continued to work for the Good Samaritan Society in the office at Good Samaritan Towers and College Way Village Apartments for a total of 17 years. She made many friends and was much loved by the residents during her years there. Her final days were spent under the loving care of the Good Samaritan Society and Crossroads Hospice. She was a member of College Church of the Nazarene in Olathe and she very much enjoyed worship services, Sunday school and the Senior Adult activities and trips until she became homebound in her later years. Visitation will be on Monday, January 25, 2016 at 1:00 p.m. at the Penwell-Gabel Olathe Chapel, with funeral service immediately following at 2:00 p.m. She will be laid to rest privately at Oak Lawn Memorial Gardens, Olathe, Kansas.